As a system administrator you sometimes may need to analyze the running processes. Not only to make sure that no unknown processes are running, but also to make sure they are running with the correct rights. While you could use a program like the Windows Task Manager, or the advanced Process Explorer for that, you could also use a specialized tool like UAC Process Analyzer to analyze a running Windows process. 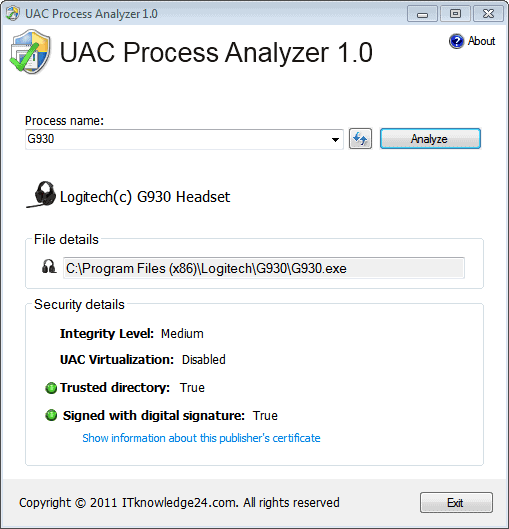 UAC Process Analyzer is a free portable software for Windows that can be used to analyze any running process of the Windows operating system. The program scans the system for running processes automatically to display them all in a selection menu at the top. You can use the menu to select a process that you want to analyze, or hit the refresh button to run the process identification scan again. Once you have selected a process you need to click on the Analyze button to populate the information in the lower half of the screen. The program displays the process' name and file path next to security details. Listed there are the process' Integrity level, UAC Virtualization, Trusted Directory and whether it is signed with a digital signature. A link to open the publisher certificate is displayed if the process is signed with a digital signature. The information presented by the program are mostly useful for system administrators and not the average user. UAC Virtualization for example is an advanced concept which basically redirects write attempts to protected storage to the user's own directory. It is more complicated than that, and if you really want to know more about it you could read the introductory post over at Technet.